New to our Paint Department are the DEFY wood semi-transparent stains and their innovative nano-technology! What does nano-technology mean when it comes to deck stains, you may ask? Nano-technology means that there are millions of tiny zinc oxide nano particles dispersed throughout the stain. In fact, there are over 30 trillion particles per square inch! These zinc nano particles nestle down in the pores of the wood and provide a more effective seal against the sun’s harmful UV rays. They act like sunscreen for your deck! 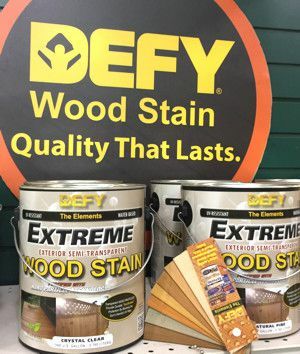 At the same time, DEFY’s semi-transparent wood stains help to resist the growth of mold, mildew, and algae. Available in 7 beautiful colors. Need to clean your deck, but looking for a safer alternative to bleach? The DEFY wood cleaner is an oxygenated bleach powdered concentrate that is safe for outdoor vegetation and safer for those applying the product. This product is diluted in water and then applied to your deck with either a pump sprayer or a watering can. It’s easy to use and produces great results. Removes graying, mill glaze, dirt, and worn old finishes.